MV Manta Queen 2 is always among our most popular boats, and all our MQ2 guests come back with big smiles on their faces. 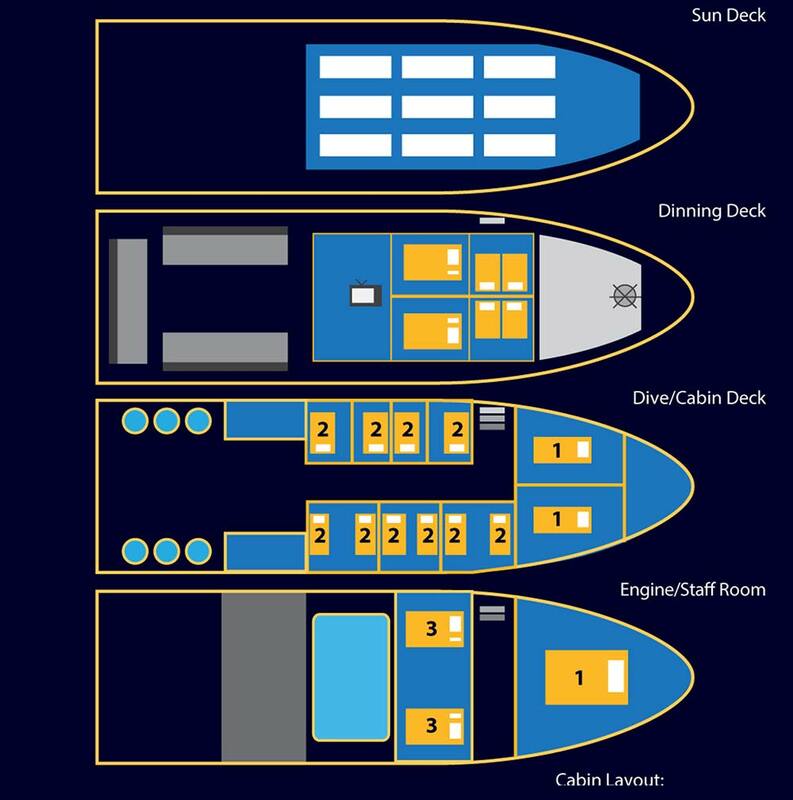 This 25-metre diving safari boat can take up to 20 guests in air-conditioned comfort. 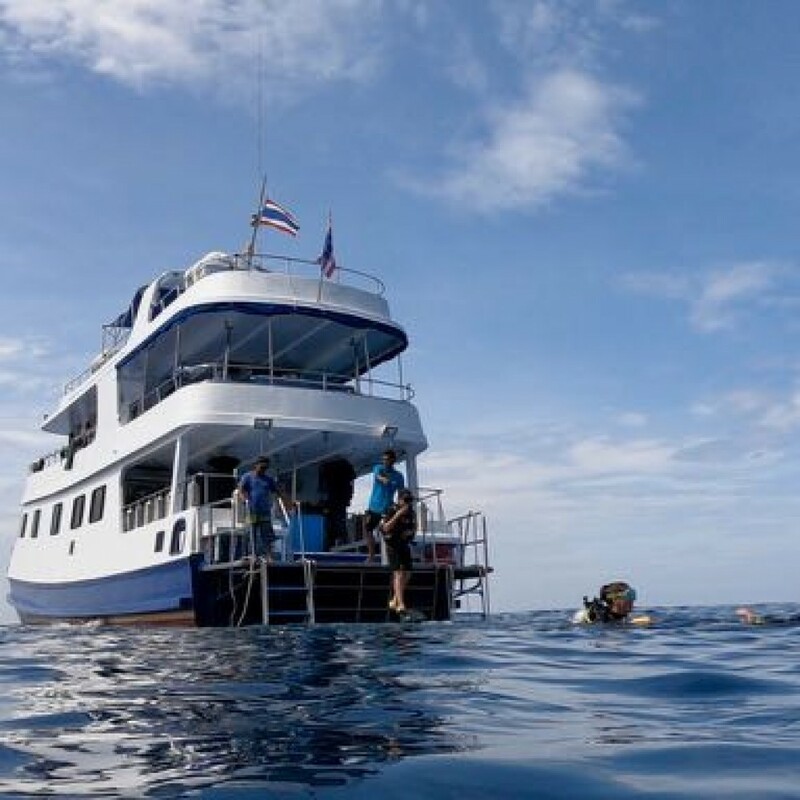 Although most of Manta Queen 2’s guests are experienced divers, inexperienced divers & those learning to dive can also join these 3-day 11-dive cruises to Thailand’s very best dive sites. 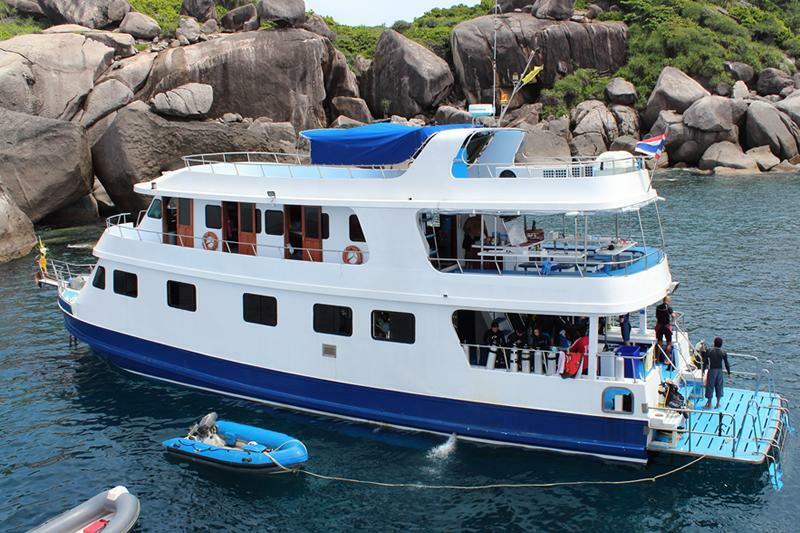 Most Thailand diving safaris are 4 days in length and first sail to the Similan Islands, then move north to Koh Bon, Koh Tachai & Richelieu Rock. But Manta Queen 2 goes directly to these ‘northern sites’ to give the maximum time underwater at the best dive spots in Thailand. 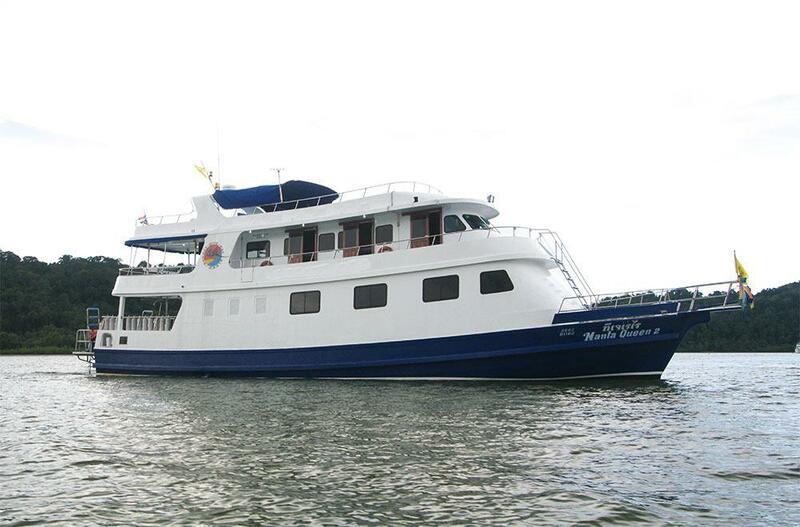 Each trip starts at Koh Bon, famous for Manta Rays, then sails up to Koh Tachai, with its wonderful marine life & reef. Finally, divers get plenty of time at Richelieu Rock, which is regarded as the best dive site in Thailand. On the final day, Manta Queen 2 stops off again at Koh Bon, then a local wreck before returning to the pier. 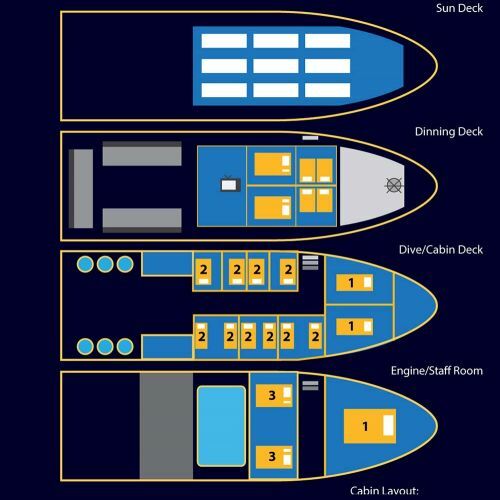 Manta Queen 2 has a wide range of cabins, all of which are air conditioned, clean and comfortable. 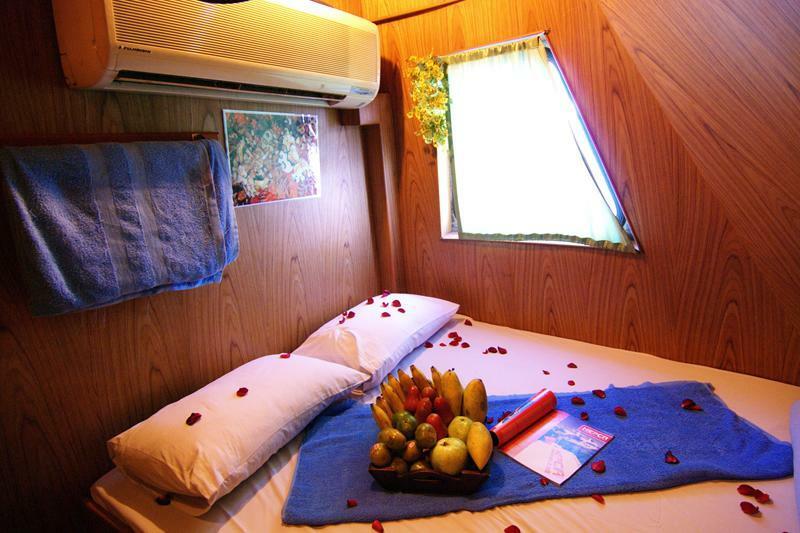 There are three double-bed cabins for couples, five twin-bed cabins if you want a bed to yourself but not share with too many others, and a four-bunk shared cabin for those who want the lowest-price Richelieu Rock diving experience. 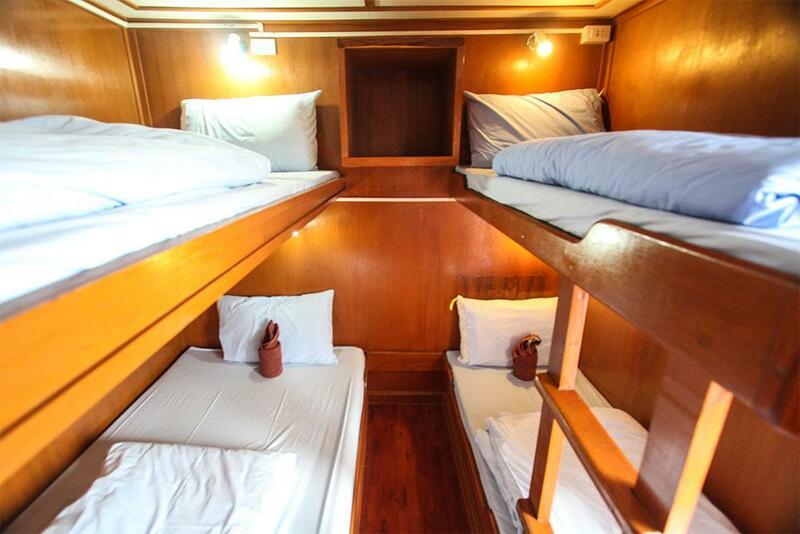 The four-bunk cabin is also great for a family or group of friends. Great food is served buffet style throughout the day, and there are snacks and fruits, as well as tea, coffee & drinking water all for free. The dive staff & boat crew take great care of the guests, with regards to safety, advice, diving, dive gear, food, and lots of sociable fun. Manta Queen 2 really is the ideal diving boat for divers with some experience who want to enjoy the best diving in Thailand without spending more time or money than necessary. Free local transfers are also included. And new for 2018-19 MQ2 has Free Wi-Fi. However, this is dependent on the cellular signal, and due to MQ2's itinerary to remote locations the signal is not available all the time. 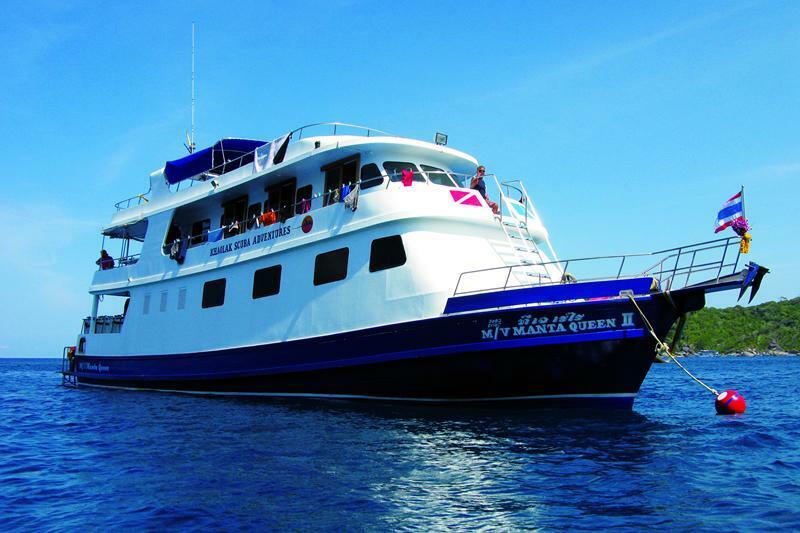 Manta Queen 2's itinerary goes directly to the 'Northern Dive Sites' of Koh Bon, Koh Tachai & Richelieu Rock. There is no beach visit at these areas, because Koh Bon has no beach, Koh Tachai's beach is currently closed to the public, and Richelieu Rock has no land at all. The boat departs in the evening, and guests are served a light meal on board. Diving begins the next day in the morning at Koh Bon. There are four dives for the first two days, then three dives on the third and final day. Koh Tachai & Richelieu Rock are not suitable for night diving, but are perfect for long day or sunset dives. 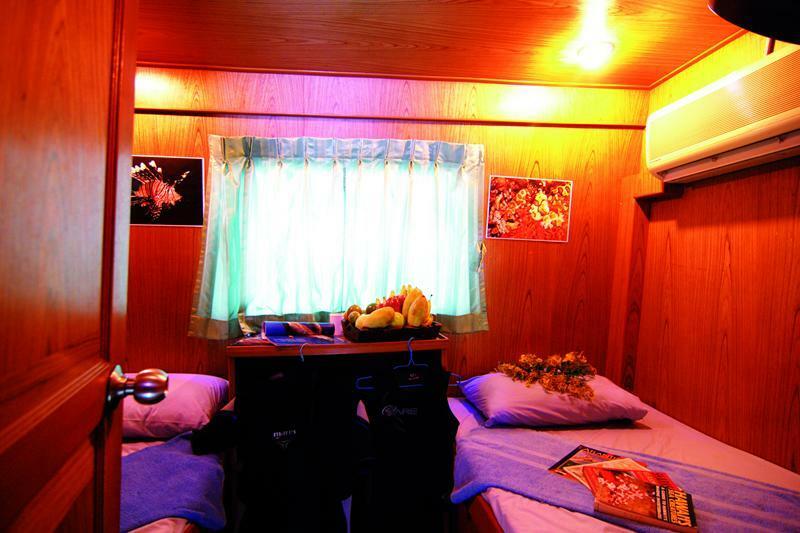 Therefore, MQ2 trips normally do not have a night dive. Engines. 2x Hino 350 HP. Boat Crew. 1 Captain, 1 Engineer, 4 Deckhands, 2 Cooks. Dive Crew. 1 Tour Leader, 1 Blender, 3 Multi-lingual Divemasters / Instructors. Safety. VHF Radio, Emergency Oxygen Unit, Liferaft, Life Jackets/rings, First Aid Kit, Satellite Phones. 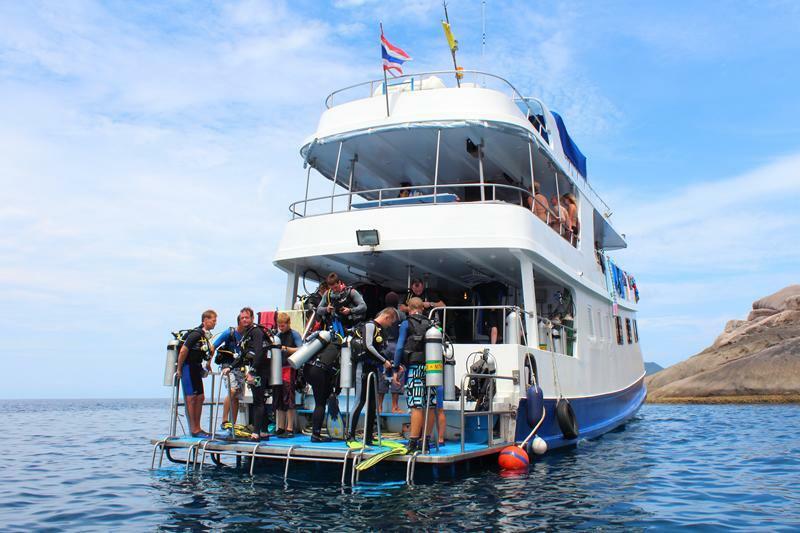 There is a range of PADI diving courses available on Manta Queen 2, including Enriched Air Nitrox (EAN), and the the Advanced Open Water Course. It is possible, but not common, to learn to dive on Manta Queen 2. It's important to understand that the dive sites aren't ideal for learning to dive, and there may be one or two dives that learning divers need to miss out on. Also, it's unlikley that other guests will be learning to dive on MQ2, meaning that a one-on-one surcharge is likely for private tuition. 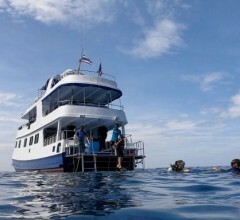 *Open Water Diver candidates need to arrive in Khao Lak at least a full day before Manta Queen 2 departs. This is to complete ‘confined water’ skills training, watch videos and do the theory & tests. 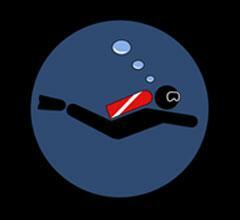 Also, if no other divers are taking the course on MQ2, there is a surcharge one-on-one tutoring. E-learning candidates are welcome, but please enquire for details and prices BEFORE signing up for e-learning on the PADI website. The Manta Queen team use several minivans to collect divers from their hotels and from Phuket airport. Each minivan is prepared with a set route, times and guest numbers. Those staying in Khao Lak can take come to the dive centre, or have free scheduled transfers on departure day (4.00-4.30pm). 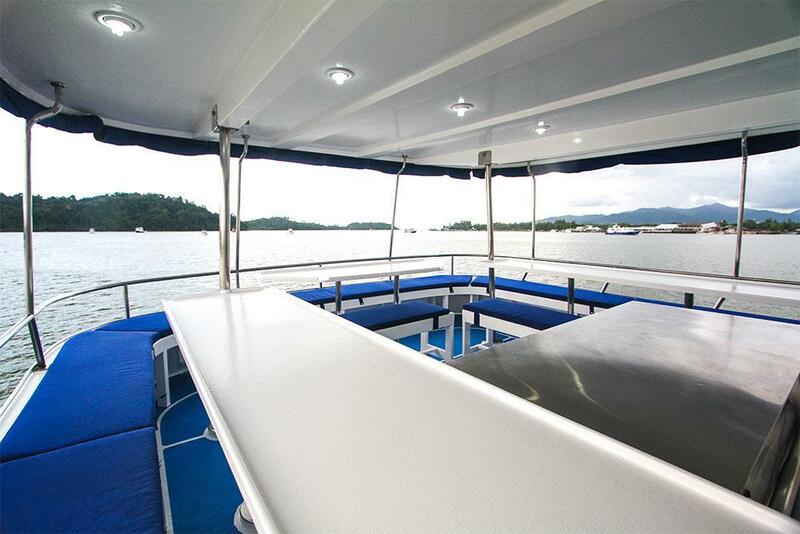 Manta Queen 2's Phuket guests can get picked up for 300 THB / person. The scheduled times start at 11.30am, and the latest Phuket hotel pick up is at 3.30pm. Everyone is taken to the PADI dive centre first to sign a few forms, make final balance payments, and fit any rental equipment. At the end of the MQ2 trip, everyone is taken back to the dive centre, then transferred to their chosen resort, hostel or hotel. The boat is awesome. All thai crews are very fantastic. Food is healthy and tastes good. I enjoy the most with the Richelieu Rock, which is undeniable of one of the best dive site in the world. Dive sites were amazing and your service and communication was prompt and courteous. You did a great job getting us there. MQ2 didn't really meet our expectations - it's basically a backpackers/budget experience. Maybe we didn't ask enough questions, but NTJB left money on the table by not recommending us the MQ3 trip that left at the same time for one extra night. Everything had been good, the crew was good, food was good! Esp the dive instructor Nick, he was very funny and helpful! 2 thumbs up! Will come back again in the right season. Great trip, very well organised! A fun trip on a basic but great boat! Food and staff were great. Saw some majestic mantas and a lot of fish. The rental equipment could have been better. I had an issue with equipment malfunction on my last dive. 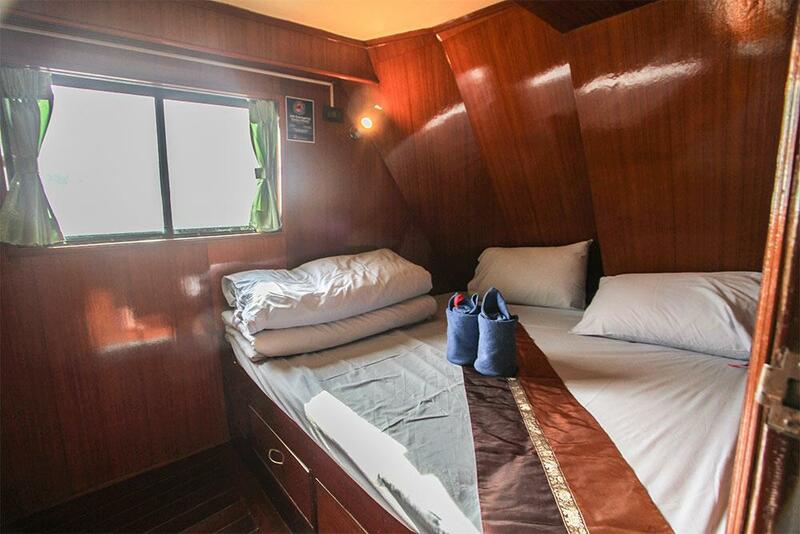 Rates are 'per diver' and include full-board accommodation, meals, fruit, snacks, tea, coffee & drinking water. 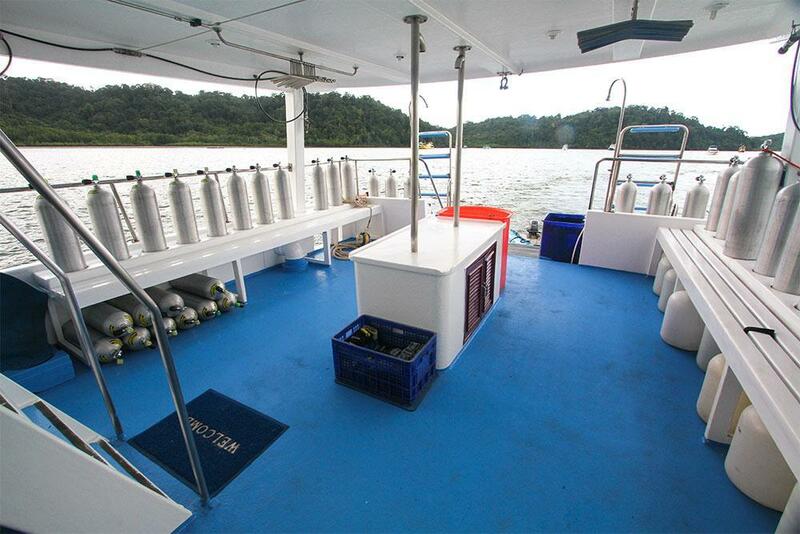 Weights, weighthbelts & 12-litre tanks are included, as are all meals, snacks, fruits and most non-alcoholic drinks. Equipment is available for rent for 400 THB / day (1,200 THB / trip). Non-diving guests get a 1,000 THB discount and pay less national park fees. National Marine Park entry & diving fees (1,600 THB / diver).